The annual ‘swanfall’ at WWT Slimbridge has kicked off with a flurry of Bewick’s swans checking in for the winter. A total of 51 birds completed the final leg of their migration during the recent crisp nights and they join Indri, the first of the Bewick’s to arrive at the reserve, who appeared in October with the first cold snap of the season. Among the wild winter visitors is old timer Croupier, aged 27, the leader of one of the biggest Bewick’s swan families ever studied. The ‘Cobfather’ was sadly minus his long-term partner, Dealer, who is mum to 29 cygnets that they have brought back together over the years. Swan Research Assistant Steve Heaven helps conserve the Bewick’s swans, which have been in decline in Northwest Europe since the 1990s. He said: “The arrival of lots of Bewick’s swans is a traditional harbinger of cold weather and it feels truly wintry here at WWT Slimbridge with chilly, clear days and more and more migratory birds crowding onto the lake at dusk. It’s always a fantastic spectacle over the Christmas period. The arrival of lots of swans in this way – dubbed a ‘swanfall’ – generally coincides with the onset of winter, as the birds navigate some 4000km from Arctic Russia to the UK to seek ice-free wetlands to feed and roost. The swanfall is a welcome surprise after mild weather allowed many of the birds to remain in Eastern Europe earlier this month. 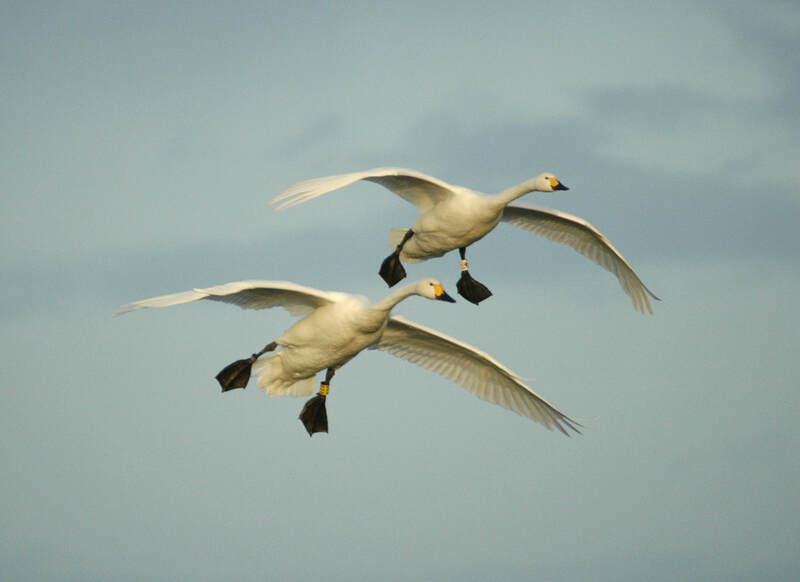 Trotsky, the first Bewick’s swan to move in last winter, made the headlines as one of our latest first arrivals ever recorded, keeping staff on the edge of their seats until November 10. The Slimbridge Bewick’s swans are the subject of one of the most intensive wildlife studies in the world. WWT’s expert researchers can identify each individual swan by the unique pattern of yellow and black on its beak. The study has been running continuously for over 50 years and recorded the life histories of nearly 10,000 swans during that time. WWT has expanded its swan research over the decades and linked up with researchers throughout the migratory swans’ range in northern Europe and Russia. Together they have managed to secure international protection for a chain of wetlands along the way that are vital for the swans to feed and rest. Staff are able to take care of these marvellous animals because of the generous support from Postcode Animal Trust, a grant-giving charity funded entirely by players of People’s Postcode Lottery, whose funding helps make their stay a happy one. For an extra special experience visitors are invited to access Slimbridge after hours and witness a spectacular commentated floodlit evening swan feed which includes the Bewick’s swans, followed by a delicious two course meal in our Kingfisher Kitchen restaurant. Our Swan Supper Evenings run every Friday and Saturday evening from 30 November to 9 February.